Fire as observed rising from the location, and fire trucks, photo taken from 33rd Street off National Avenue. On the clifftop at the top of the picture are the other fire vehicles, fire personnel, and residents. At around 4 in the afternoon on Monday, March 31, fire trucks and vehicles were heading down National Avenue passing 32nd Street, then some of the trucks and vehicles came back and were heading down 32nd Street, as if they were circling around lost. “We got calls giving us different addresses,” an official standing near a Fire Battalion truck later explained. Photo taken from Newton Avenue clifftop, looking down on the site. Fire personnel working around the location of the fire. The confusion arose partly because they were responding to an odd location. 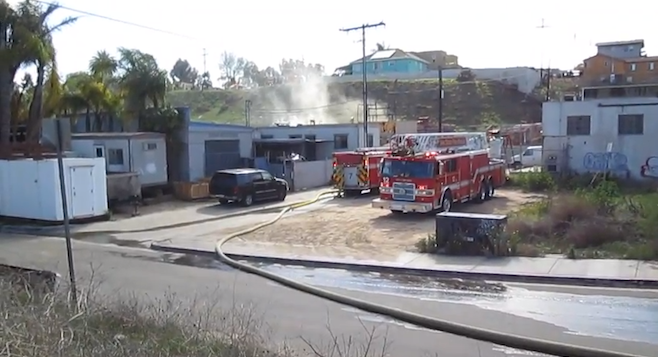 The fire was at a business located on a patch of land which meanders off National Avenue at 33rd Street, the land and business bound on one side by the Chollas Creek channel, on the other side abutting a fairly steep cliff. One block south of National, Newton Avenue extends a short way past 32nd Street, then dead-ends atop that cliff, in a cul-de-sac overlooking the area where the fire was located. Some firetrucks ended up operating from down at National and 33rd Street, with more firetrucks at the cliff top on 32nd Street and Newton Avenue. A view from the top of the cliff at 32nd and Newton, looking down at the location, told another story. Inside the site, several firefighters were standing mounted around a tall stack of industrial wooden pallets surmounted by a stack of very large metal panels. Those pallets were stacked against a metal chain link fence which enclosed the perimeter of the business, running along the bottom of the cliff; the fence appeared to be six feet or more in height with barbed wire strung across the top, in some places encircled with concertina wire. Firefighters were outside the fence, in the gap between the fence and the cliff, operating a hose aimed at where the fire appeared to be burning, in the pallets beneath the metal panels, and which despite constant dousing, did not seem to want to die down. The firefighters then began a coordinated effort to remove the stack of metal panels in order to get to the wood pallets, and the stubborn fire, underneath. Photo taken from clifftop on Newton Avenue looking down on the location of the fire. Another man appeared on the cliff, with a lanyard photo ID that identified him as an employee of nearby NASSCO. It turned out he owned the property on the south side of the cliff top, while the other man, the observer, owned the property on the north side of the cliff top, the two houses facing each other across the cul-de-sac that bordered that end of Newton. “That business used to be called American Scaffolding, but that was years ago,” the first observer said. “Back a long time ago, the city owned this hill, but then they sold it to the guy, he owns it to almost the top of the cliff. A few months ago he came up here offering to go fifty-fifty with us to hire people to clean out all the brush on the cliff, but we said No, it’s your hill, you clean it. So he did, but the brush is growing again.” The cliff was covered with grass and dried out tumbleweeds. A man in a business suit appeared out of nowhere and strode out to the scene on the cliff. “Oh this is nothing, this is something their insurance will cover,” he said, glancing at the scene below. He identified himself as a state insurance adjuster, who said he heard about the fire and came to take a look. When he observed that the firemen were cutting the fence, he said, “And they’ll get a new fence out of it, too.” At which point the man who owned the home on the north side of the cliff said he had been told years ago that a retaining wall along the proper boundary line at the top of the cliff would run something like half a million dollars. As he was leaving, another car pulled up, this one stenciled with a television station’s logo, Univision. The cameraman set up his shots then spoke to the owner of the home on the north side of the cliff. Guided by questions from the cameraman, the owner began to talk about the long list of grievances against the business owner and how the city had been waging a years-long battle with the business seemingly to little or no avail. Meanwhile below at the bottom of the cliff the firefighters continued their work on the smoldering fire; it was near five o’clock and the end appeared to be nowhere in sight.